You may know Laurel Marsh from her rock ‘n roll world. She was bass player for Boston-based all-female rock band Jaded for six years. She’s currently singer/bass player for Connecticut melodic metal band Suicide Dream and half of Boston/Worcester electronic band (duo) ZagreuS. In addition, she records solo. 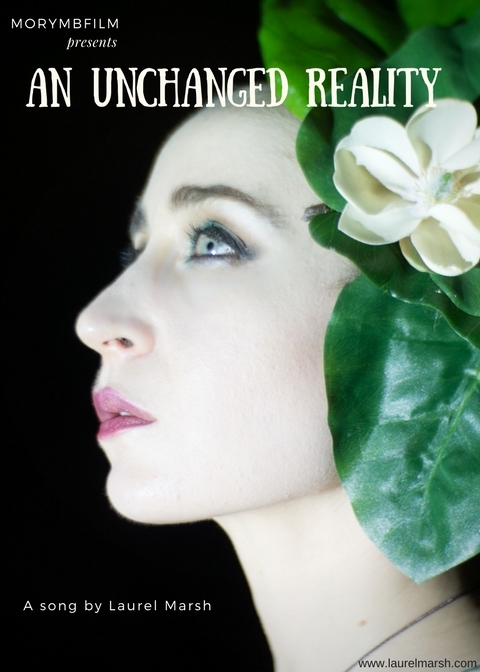 “An Unchanged Reality” is Laurel’s latest piece of solo work, released in September 2017; it was preceded by “Heart Speak” earlier in the year. This song was designed to be experienced via sound and visual, via music video. But I tend to get a lot more time to listen to music than to watch videos, so I decided to review it from that perspective. As a soaring, atmospheric number, it takes a few listens to sink in without the video accompaniment. With musical tidal surges rising and falling and the ever-presence of Laurel’s simultaneously sweet and ominous vocals, “An Unchanged Reality” floats and soars not unlike a lot of alternative atmospheric pop music, but this song is infused with a primal rhythm, as well. And the vocals? Controlled power, the sort that’s essential for a hard rock or metal singer. Well, a good, versatile one, at least. The vocals are so musical in nature, I often find myself forgetting that this song isn’t purely instrumental, with the words themselves less important to the experience than the sounds they provide and their vocal delivery. After a few listens, I began to anticipate the weaving, enchanting, smoothly lurching rhythms, and “An Unchanged Reality” has become a playlist favorite. I find myself whistling or softly chanting along with its haunting melodies, looking ahead to their next subtle twist or turn. Again, though, the song is visual in nature, and it’s really worth watching it in video form via its YouTube video here. You won’t be surprised by the use of water or the integration with nature in the video; indeed, it is an exceptionally well-suited visual representation of the music. Or perhaps the music is an aural representation of the video. The two are so intertwined it’s difficult to separate them (even though I did and am impressed by the enjoyable audio experience). As was the case with “Heart Speak,” “An Unchanged Reality” was a two person project. The descriptions on YouTube video pages show how the arrangements, performance, and visual presentation duties were split between Laurel and Joel Booska. In addition to being a multi-talented, genre-crossing (and genre-bending) musician, your visit to Laurel’s website will introduce you to her yoga instructor work and her modeling pictures, as well, in addition to linking you to her various musical endeavors. But it is here, through the main page, where you’ll find information about upcoming performances. The most recent was a radio show appearance with ZagreuS on January 29th. Check back here and perhaps follow her to see what lies ahead.